Method Studios delivered 280 largely invisible VFX shots for the crazy successful Warner Bros. hit, Crazy Rich Asians. Directed by Jon M. Chu, the film follows New Yorker Rachel Chu as she travels to Asia accompanying her boyfriend Nick Young to a wedding in his native Singapore. Upon meeting Nick’s extended family, she discovers that the Youngs are incredibly wealthy and that Nick is one of Singapore’s most eligible bachelors. Serving the story rather than providing spectacle, Method’s VFX work seamlessly integrates into practical footage. 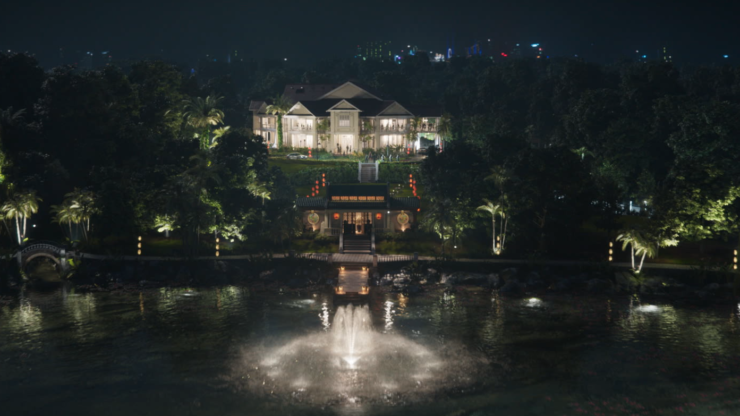 Method artists’ biggest undertaking for the feature was digitally enhancing the Young family estate in Singapore for a lavish party scene. Shot on location with 200 extras, the scene featured a large house and gardens beautifully decorated for an elegant evening. During the edit, Chu wanted to make the scene feel even bigger, with more grandeur. Method artists extended the location digitally, and added a winding road, pond, and fountain, in addition to adding more crowds, vehicles, plants, trees, and flowers. The CG lighting recreated what was established on set, with uplit trees and digital key lights added at the same height they would have been on location cranes. Method’s involvement with the shoot gave the team an advantage in understanding context for the VFX, and their on-set reference photos for the party scene proved highly valuable in tackling the unexpected challenge.